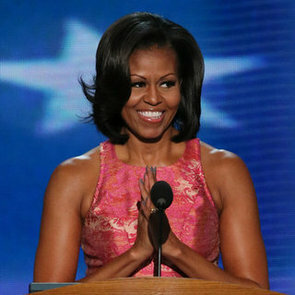 First Lady Michelle Obama delivered a heartfelt speech mostly neutral on policies, but there were a few specific mentions of first-term achievements as well as lines that spoke in contrast to Republican National Convention speeches. But the most politically effective lines in the speech were also the most personal when she described a caring human being, a loving husband and a devoted father called Barack Obama. She drove home a message that you cannot separate what makes Barack Obama the man and Barack Obama the president. This is a direct appeal to the fact that a large majority of Americans like President Obama as a person even if they don’t agree with him on the economy or other policies. The speech was remarkably well crafted from a political perspective. It made this one argument. — The president has incredibly high favorability ratings personally. — Handling of the economy is the thing he’s lacking on. And the argument Michelle Obama made said there is no distance between the two. The personal is political, to re-appropriate a second-wave feminism term. — She was saying if you like the man Barack Obama but feel a little “eh” about where the country is, you can’t separate who that person is once they get in the Oval Office. — The speech made a very explicit argument that the things that are the biggest political strengths of the president should be the controlling, determining factor in casting your vote. Barack and Michelle Obama embody the very essence of the American Dream that Republicans talk about. It is for this reason that it’s remarkable to hear the level of vitriol from the Right with regard to President Obama’s stewardship of the nation.